My new tattoo… girl with double barreled smoking shotgun and dirty wizard… Boo Ya! 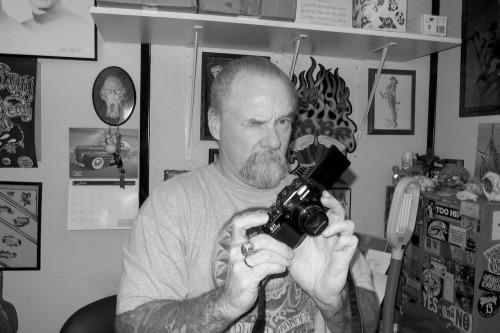 Jack Rudy taking a picture of Terry Richardson after finishing his new tattoo at 7am… in my opinion Jack is one of the greatest tattoo artists of all time. Tattooed Mannequin inside Good Time Charlies Tattooland in Anaheim CA. © 2019 Good Time Charlies Tattooland.